It was the weekends, and off I went with Janice to yet another desserts place in SS2, PJ. 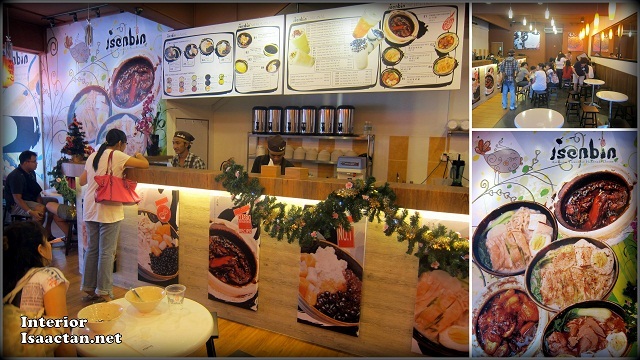 This time our venue was the desserts place named Isenbin Authentic Taiwanese Handmade Desserts. We reached there in the late afternoon, just in time for tea break, and what a heavy tea break it turned out to be. Initially upon hearing the name Isenbin I thought it was going to be a Japanese dessert or something, until I was educated by dear Janice that it means "I Love Fresh Ice" in Mandarin. With such a bold name, I would assume the ice used in all Isenbin's desserts were fresh, which was a good thing. I've been to enough desserts shop to know one thing, and that what sets each apart were mostly on the freshness of their products as well as the presentation of their desserts. I have seen better places, but Isenbin was a decent enough spot to hang out with friends over some cold ice desserts. Do check out what we had that evening together with some other friends. Why is the name called Covermilk? Well, after asking around, again I learnt something new. The covermilk which was used in these drinks were essentially milk mixed with some unique mix, and layered. Blending together with the tea, it does give off a strange taste at first, with a slightly salty taste that overwhelmed the tea. I do prefer the Winter Melon Milk Tea as it tasted more "normal", plus I love winter melon with the springy pearls inside. The desserts came next, in this rather huge serving for only RM6.50. We could get a choice of up to 3 combinations per dish. Even though the serving were really big, I was slightly taken aback by the presentation of the desserts. It looked rather messy with no clear outline which unfortunately made the dish unappetizing. The taste however was much better than it looks. Now I have to admit that personally to me, I am not really able to differentiate between one ice desserts to another save for the sweetness and the ingredients in it. I still wonder sometimes what makes all the ladies go crazy over these iced desserts. Now this I like, the Lemon Jade Jelly that came was really sweet with a jelly like feel to the whole dessert. I love sweet stuffs, and this dessert really kicked off my taste buds as it was both sweet, sour and refreshing at the same time. I did not mind having second servings of this. After so much ice in my system, I was really glad to find out Isenbin serves hot ramen noodles as well. We were served first with the Braised Beef Noodle Soup, which had these really soft beef slices in a spicy soup base with soft ramen which I really like. The beef just wasn't enough. The next two dishes that arrived were the Ramen Noodle Soup, both the spicy and non-spicy version which wasn't bad but still I preferred the Beef Noodle Soup. Overall it was a good outing with friends. Judging by the huge crowd that turned up at Isenbin Taiwanese Desserts SS2 that Sunday afternoon, I can summarize that desserts shop will continue to exist at every corner because it is a really good place to unwind and have something light besides the heavy food we usually get at cafes or restaurants. Yup, so can drink and eat at the same time! I like the eating part.. lol! I'm not a very big fan of desserts too! so you're not alone. Lol! but janice likes it. Thanks for dropping by ya! hehe, nice noodles there.. nom nom nom! Another Snowflake copycat? LOL! Oh, at least they have beef ramen. Wanna try that! been there before a few times and it's way better than UFO lol. Oh no, not another snowflake.... No, thank you! Can't wait to go back for the beef noodle!